I have been obcessing over tartan these past few days! I bought the most adorable tartan slippers and I just can’t wait for this rain to stop so I can welcome fall with them on my feet! :) Click read more to find out where to shop them! Tenho andado obcecada com tartan nestes últimos dias! Comprei uns slippers em xadrez, super adoráveis, e não posso esperar que esta chuva passe para dar as boas vindas ao outono com eles nos pés! :) Cliquem em read more para descobrirem onde comprá-los! 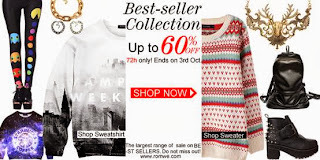 P.s.-> If you are really into finding some new items for your wardrobe, like I am, check out Romwe's website! They're hosting a huge sale and also some contests!!! Here's the link! Click in the picture to find out more! P.s.-> Se, como eu, andam à procura de novas aquisições para o vosso armário espreitem o site da Romwe! Estão com enormes promoções e concursos! Aqui vai o link! Cliquem na imagem para espreitarem as promoções! Best-seller Collection! Up to 60% off Do not miss! Os sapatos são um sonho que faria qualquer outfit bem mais 'feliz', e adorei a ideia do lacinho! I really like tartan. The fifth shirt and the skirt are my favorite pieces. Love the peter pan collar shirt, the dresses and the bag. Great post. I really enjoy the tartan print! Such a delight. These are so cool and they so much in vogue this season. A camisa  é linda linda linda! I love combining tartan ítems witch denim skirt. A perfect selection! Great post! I love #3 and #10! Thanks for stopping by, you have a lovely blog, keep in touch! Voy a ver la página que recomendaste, porque las cosas que subiste son GENIALES! The last dress and skirt are my favourites :) Espero que andes muy bien, te invitamos a pasar por nuestro espacio. Abrazos! hey girl, yeap tartan will be a must have for this season! I agree..
fabulously chic pics, loving 3, 6 and 9 most of all. Always glad to see you stop by...Happy End Of The Week! I love the tartan trend so much, so great for winter and autumn! Great blog, do you wanna follow each other on bloglovin? Looking at all this fab stuff, I need so much tartan in my life ! I love these picks of urs . This is an amazing trend, i love it! Loving number1 and number 6! everything's great but i love number 2. and 9. Love love love the tartan trend !!! For me it´s the same, can´t get enough from tartan at the moment, and now I´m happy that I still own the blouse which you show with #5, my blouse has only additional studds :) But I need urgently more stuff with this pattern! Eu também adoro, já tenho umas calças e umas camisas do ano passado! I love plaid, it is always in style ! I am a new follower, would you like to follow each other ? Love the tartan trend, nice selection! Tartan is so pretty, perfect for the winter season! My favourites are number 1 & 2 , love it a lot! Thank you for your kind comment on my blog. I really like your site & started following you!